Black-and-White dairy cattle were first introduced to some large cities of China in the 1870's, from USA, UK, Germany, Canada and Japan, and differed in body size and conformation according to country of orgin. 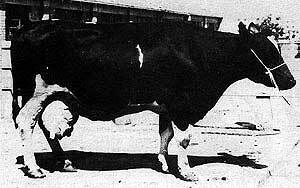 Large type Holsteins have been imported from USA since 1945, after the Second World War; Dutch Black Pied have been introduced from the Netherlands since 1950. Purebred bulls were used in grading-up on local cows, continuous selective breeding being practiced amoung superior crossbred offspring for generations. Thus developed, the Chinese Black-and-White is now distributed throughout the country. Body size of the Chinese Black-and-White varies according to the orgin of sires used in crossbreeding, and the cattle may be roughly grouped into three types; large, medium, and small. Large type cows, with an average height of 169 cm, mainly originated from the American and Canadian Holsein; the medium type, with an average height of 133 cm, are primarily developed from the Japanese and German Black-and-White, while the small type, with and average body height of 130 cm, are offspring from the Friesian sires of the Netherlands. The crossbreds are intermingled, however, and no definite ancestors can now be distinctly traced. The Black-and-White Dairy Cattle Association estimated an average of 4461 kg per lactation for 270,000 mature cows. The highest individual record has been 16,090 kg (305-day basis) by Cow No. 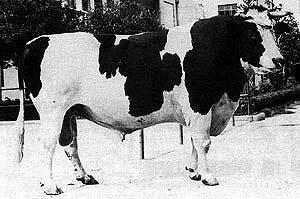 1098 in her 4th lactation at the East Suburbs Dairy Farm, Beijing, in 1970. The highest lifetime record has been 100,897 kg of milk in 3721 days over 10 lactations by Cow No. 644 from the Zhongshan Dairy Farm, Nanjing. Another two cows from the East Suburbs Farm, Beijing, each gave a total milk production of more than 100,000 kg of milk in 11 and 13 lactations respectively. Average fat percentages are 3.3 and 3.4. An average dressing percentage of 51 and a meat percentage of 39 were obtained from 8 mature cows at the Central China Agriculture College, Wuhan.